Venue Sound is a professional sound reinforcement company. 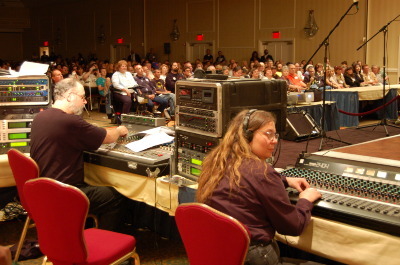 Established in 1994, we have been engineering and providing sound equipment coast to coast. Hazel LeBlanc (president) and Dave LeBlanc (VP-operations/ system engineer) founded Venue Sound in order to provide superior sound for any small to medium sized event. As Dave says "I heard a lot of poor quality sound being produced. With my background of physics, electronics and chemistry, and since I have been a musician since I was eight years old, I knew what excellent sound should sound like. At the time we conceived the company I had over 15 years experience as an engineer/tech and I knew it was time to start providing the quality of sound today's audience demands. Teaming up and training Hazel, we met our goals." Venue Sound has achieved this goal by combining the best of analog and digital, along with some proprietary modifications by Dave. Several years ago we brought in Ken Caron as our second engineer/tech (freeing up Dave to be the systems engineer) and he started working on our lighting division. We have also started working on a recording studio to be filled with vintage equipment (from Ken's and Dave's days in a rock band) and recording like they did in the old days (pre pro-tools) such as putting down a performance onto 8 track tape without all the digital enhancements such as vocal auto-pitch correction. Watch here for further updates of Venue Sound Vintage Studios! "The sound is so transparent. It's like I'm sitting in my living room and you can't tell I'm being amplified" Carl Goddard at the Boulder Coffeehouse. "Since Dave and Hazel took over engineering the sound, we've been able to do so much more in the caliber of our performances" Various cast members of the tv show Dark Shadows as heard at several festival performances.